In a gesture that stages a set from which the audience will generate the scene, Silent Fairground is a deliberate attempt to invite public experience to provoke a new relationship with place. 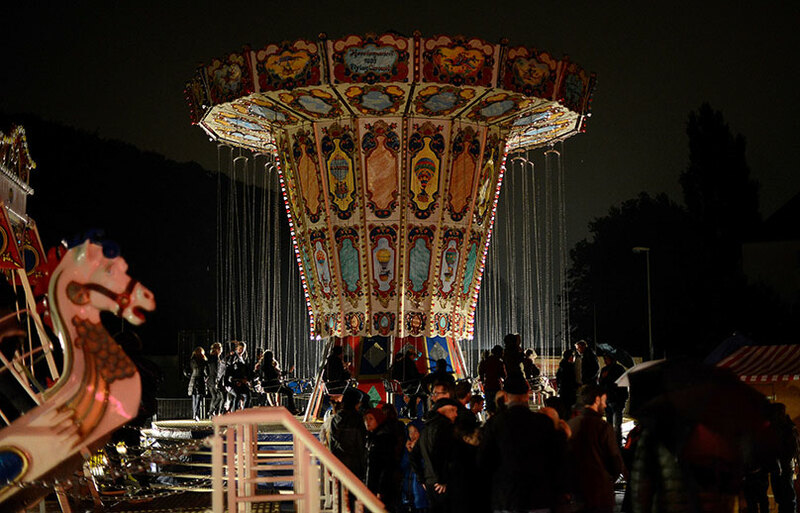 A temporary installation, Silent Fairground comprises of a carousel and fairground attractions installed on a road-to-nowhere —a road under construction as part of an industrial redevelopment in Hagen, Germany. Commissioned as part of the Urbane Lights Ruhr, an artistic festival of light organized by Urban Künste Ruhr, the installation ran for nine days attracting thousands of visitors. Sans façon created Silent Fairground with the idea that all visitors, ticket-takers and the ride operator (who had operated this particular fairground for decades) remain silent throughout the evening. As conversations fall away in the familiar setting of a traditional fairground, lit only by security lighting, the public experiences with a heightened awareness the once hidden components shaping their built environment. In Germany the connection to the carousel runs deep: Germany produced the original Flying Chair-o-Planes in the 1920s. Nostalgia for the fairground is met with the torque of the mechanical core of the carousel and the swishing sound of the seats hanging from chains, surrounded by the urban landscape at night. Although temporary in nature, Silent Fairground is a lasting work. The audience carries the moment and memory with them into the everyday. In a similar way that David Lynch has identified the “eye of the duck”—a scene in which the exact placement infuses meaning into a film—Silent Fairground is an opportunity to distance from the everyday reality of big lights and the din of voices in order to experience place from a unique vantage point.